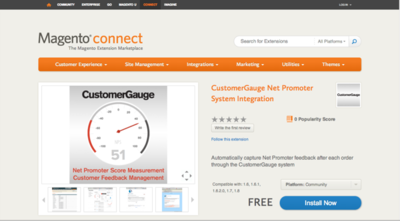 Cloud-based Net Promoter® loyalty platform CustomerGauge has released a Magento extension that enables users to automatically survey customers for their Magento ecommerce sites. The announcement means that more than 200,000 businesses that use Magento as an ecommerce solution now have the potential to implement a Net Promoter program and integrate it with CustomerGauge – a powerful, end-to-end data collection and analytics platform. The extension works by utilising the CustomerGauge API (Application Programming Interface), to automatically dispatch customer data from the Magento site to the CustomerGauge system. At a set time following a completed order, CustomerGauge automatically invites customers who make a purchase to complete a short, two-question Net Promoter survey. The survey automation process means that sensitive customer data does not need to be manually extracted from Magento, reducing the risk of data being compromised and significantly increasing the speed of the data collection process. The ability to manually "push" data to CustomerGauge – a particularly useful function for historical orders on first time use. The possibility to test in CustomerGauge development prior to pushing it to a production environment. "Using CustomerGauge to integrate a Net Promoter program with Magento has a number of benefits for Magento users. It means that the feedback collection process is fully automated, businesses are automatically provided with the tools to close the loop on customer issues, and users have access to the CustomerGauge system's comprehensive suite of real-time Net Promoter analytics," said Adam Dorrell, CEO, CustomerGauge. "With this extension, ecommerce organisations around the world have an enormous potential to bring the voice of customer into the organisation and nurture a more loyal, profitable customer base." In addition to the native Magento plugin, CustomerGauge can be integrated with Salesforce CRM and Digital River ecommerce. Learn more about the CustomerGauge integration or download the extension on the Magento Connect marketplace.